Hot springs (known as ‘onsen’ in Japan) are popular all year round it’s an especially special experience during the winter when the temperature is down and you just to rejuvenate your body. 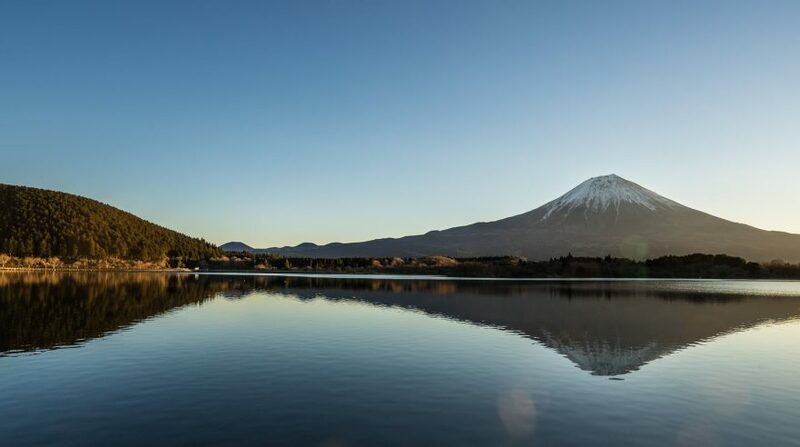 Onsen are great experiences in Japan, especially, since there are many ‘rotenburo’ (open-air baths) all over Japan where one can enjoy taking a hot warm bath while admiring the nature or scenery around. In the winter, there is just something magical about sitting in a hot body of water with snowflakes falling around you or when the area is completely surrounded by snow. 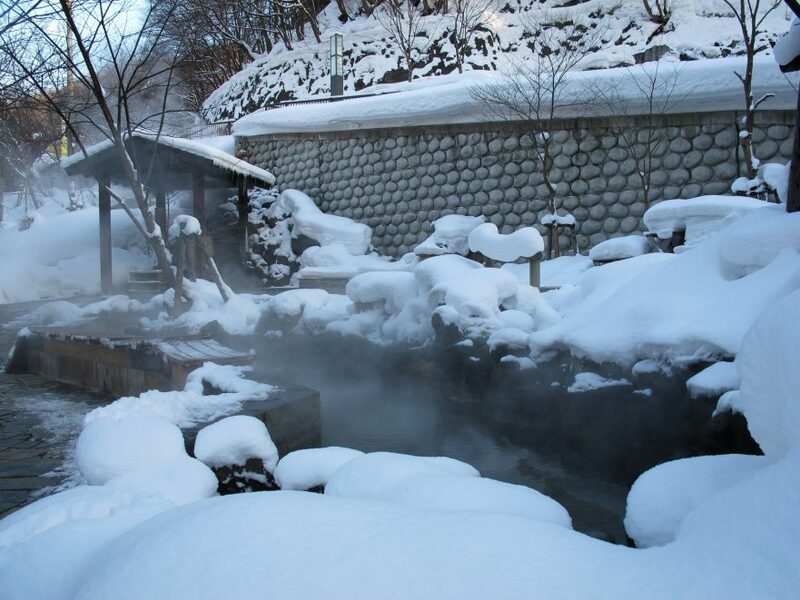 Let us show you Japan Awaits’ selection of the 10 best onsen in Japan that we’d highly recommend you visit in the winter. 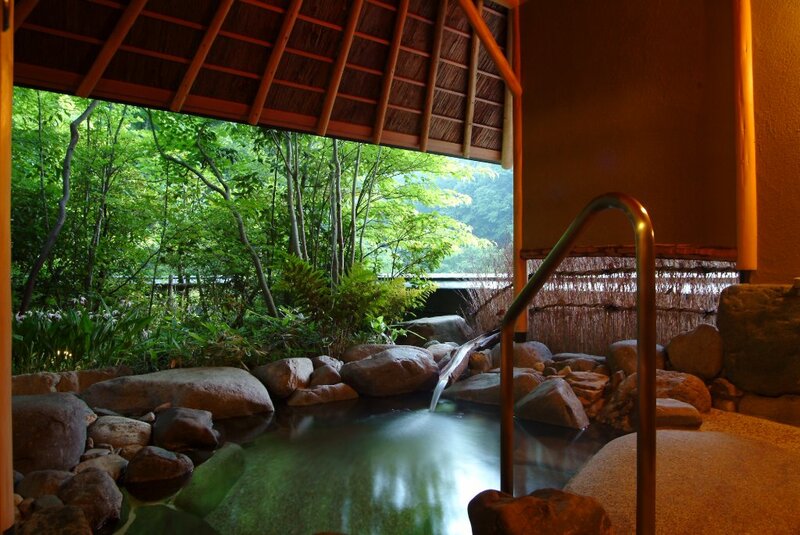 Once you get into one of these onsen, you may never want to get out. 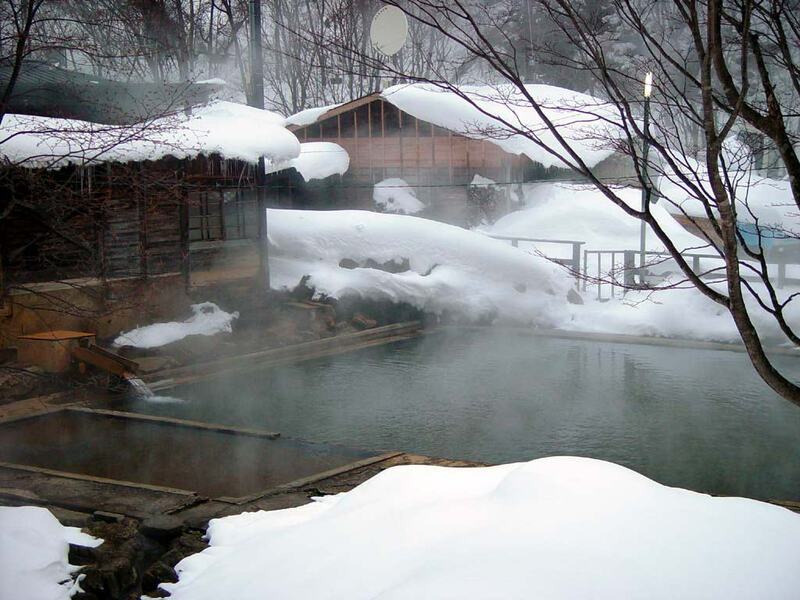 Noboribetsu Onsen is one of the most famous hot spring resorts in Japan and is very impressive all year round. 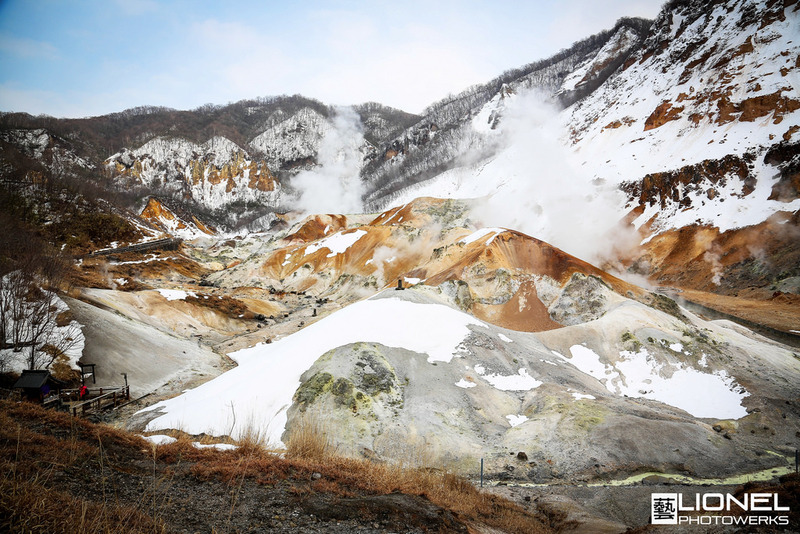 The Hell Valley (Jigokudani) is the source for its hot springs. The area gets its name from the strong sulfur smell that you can get a whiff of just by walking through the hot sand dunes of Noboribetsu. Aside from the smell (just give yourself a few minutes to get used to it), the location is quite relaxing to walk through. 1. Sulfur springs (Lousen), which help to ease chronic bronchitis (inflamed bronchial tubes produce a lot of mucus, and often occurs for smokers), hardening of arteries, chronic dermatitis and other skin conditions. 2. Salt springs (Shokuensen), is known to help ease neuralgia (nerve pain), lower back pain, and poor circulation. These hot springs are the most common in Japan. 3. Aluminum springs (Myobansen) generally ease symptoms of many skin diseases and alleviates the inflammation of mucous membranes. 4. Mirabilite springs (Boshosen) will help improve blood flow and circulation. The water is known to ease effects of hypertension, wounds, and arteriosclerosis. 5. Melanterite springs (Ryokubansen) help ease anemia (not enough red blood cells) and chronic eczema skin conditions. 6. Iron springs (Tessen) also ease symptoms of anemia and chronic eczema. This is especially great for those who have severe dry skin (usually the case in cold weather). 7. Acidic iron springs (Sansei Tessen) help alleviate and disinfect the skin which is good for those who have eczema or other skin conditions. 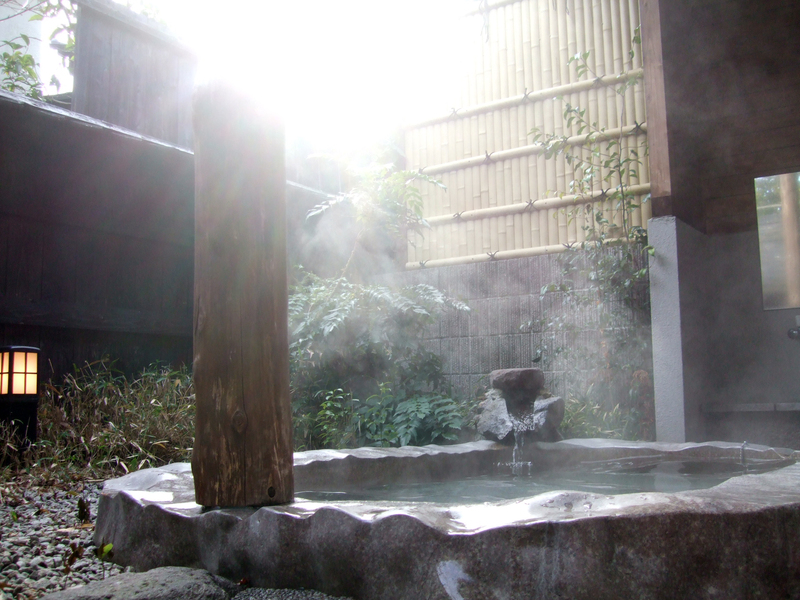 After using this onsen, you'll have to wash your body with regular water to cleanse yourself of the acidic iron water. 8. Alkaline springs (Jusosen) is known to soften cornified and hard layers of skin, as well as emulsifying secretions. The hot spring will ease skin conditions and sanitize wounds. 9. Radium springs (Radium-sen) has a strong sedative effect. They are particularly effective at easing those with neuralgia, rheumatism, and menopausal disorders. 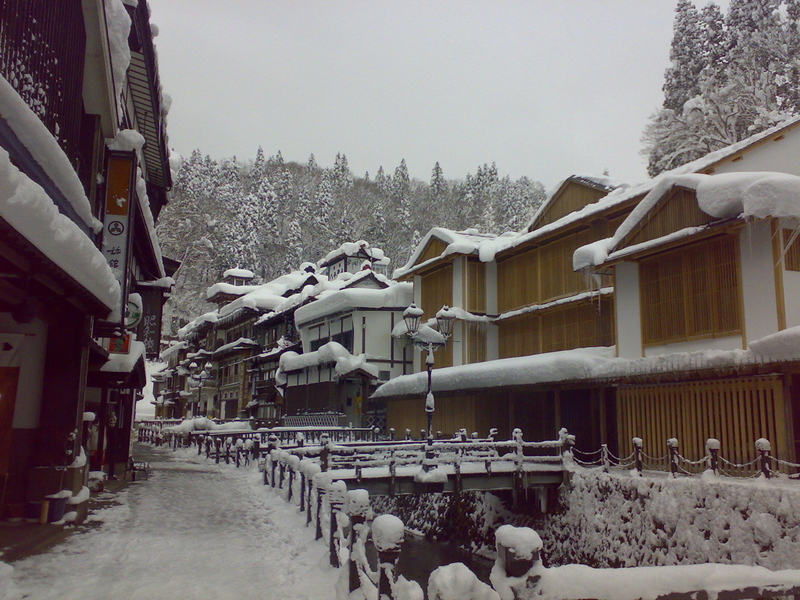 Ginzan Onsen in Yamagata prefecture is the most scenic in winter. The old town is charming with its wooden buildings all year round, but the snow really adds to the beauty and charm of the town. 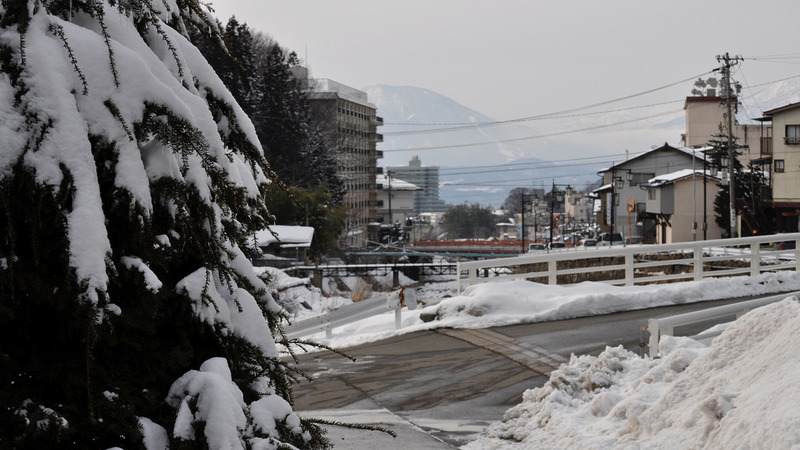 During the winter, the Ginzan area can get up to 2 meters of snow, with all the buildings and streets being blanketed in white. 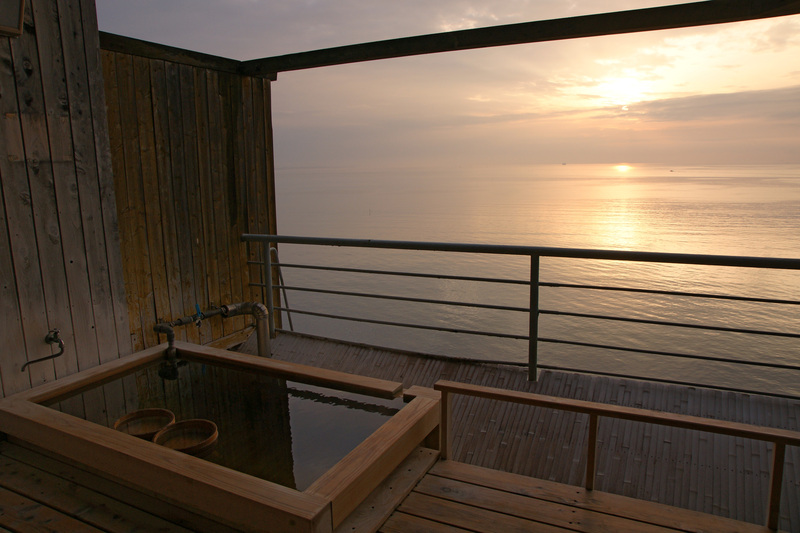 While it's extremely cold out in the streets, imagine yourself sitting in a steaming hot onsen enjoying the beautiful view. At Ginzan Onsen, there are many onsen (either in your hotel or at a public bath). We recommend strolling along the Ginzan River wearing a yukata, staying overnight at one Ginzan Onsen's many inns or ryokan, and taking an outdoor rotenburo onsen bath at your hotel if possible (they can arrange a private kashikiri bath with another companion). 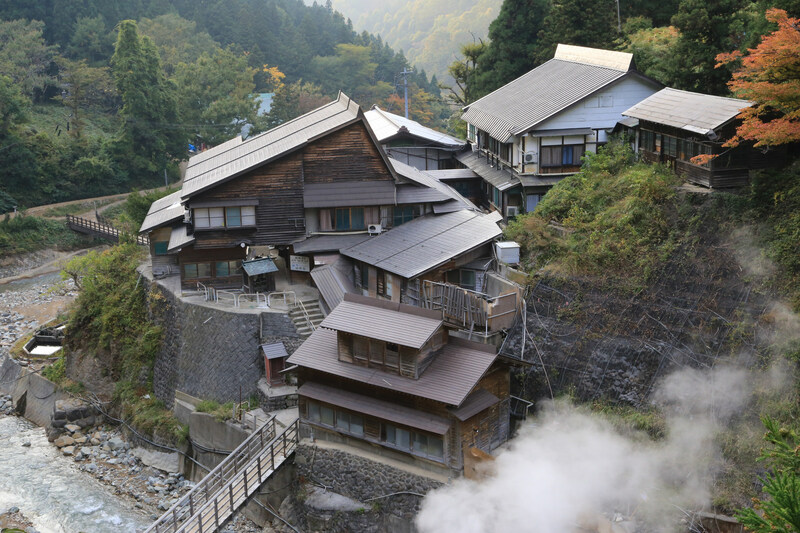 Manza Onsen, located on the high slopes of Mt. Shirane in Gunma Prefecture, is a hot spring at a high altitude (1800 meters above sea level) that can be easily reachable from Tokyo. 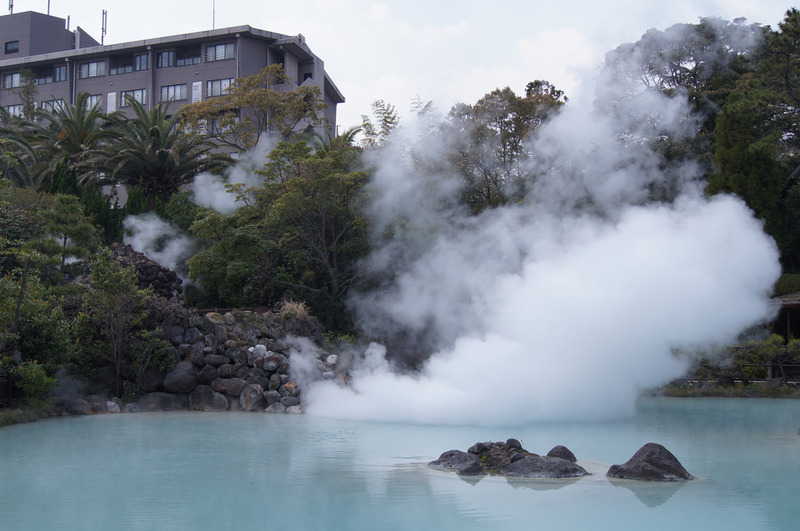 Their hot springs are very rich in sulfur and is considered one of the most sulfuric in all of Japan. Although the high-content of sulfur cases the water to look neon yellow, the sulfur really helps with treating dermatitis, improving metabolism and blood circulation. Manza Onsen is a very popular ski resort and because of this, several hotels and ryokan are known for their outstanding onsen. In the winter, the area is completely covered in snow. Imagine after a long day on the slopes, you can come back and ease those muscles in a hot bath in the comfort of your hotel. Shima Onsen is also located in Gunma Prefecture, in a sleepy hot spring town in the northwest mountains. 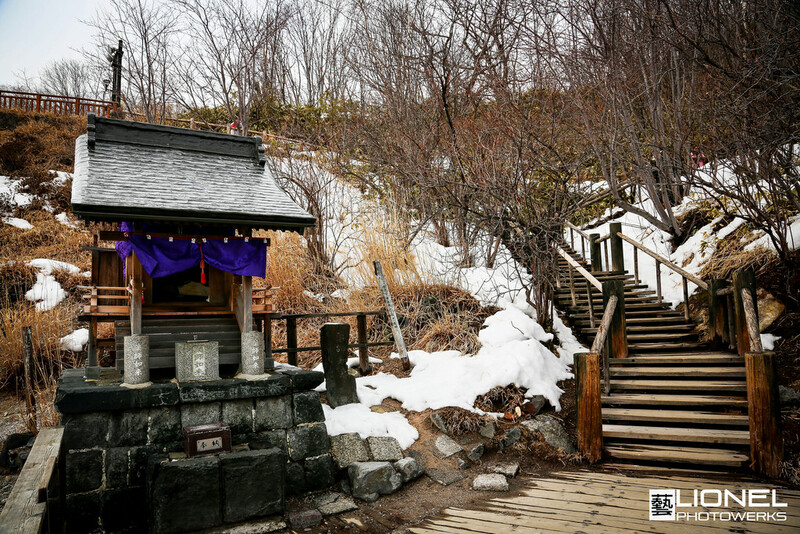 It is considered one of the top four hot spring towns in Gunma (alongside Kusatsu, Ikaho and Minakami). 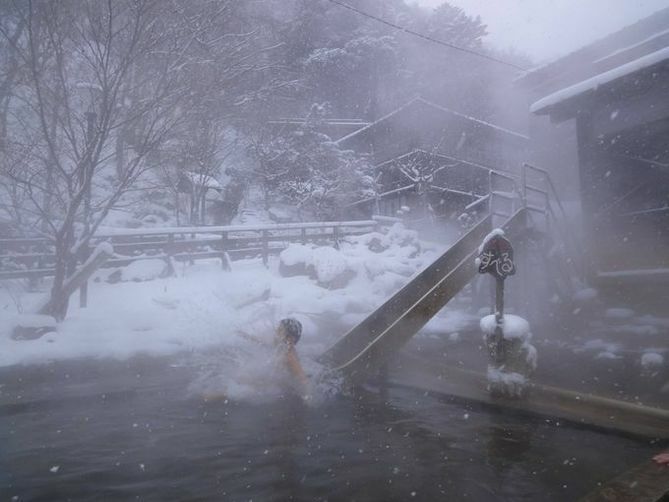 Shima Onsen, which literally translates to 'Forty Thousand Hot Springs', is one of the oldest onsen towns in Japan, and gets its name from the ancient belief that its 40 hot spring water resources could heal as many ailments as that in its name. The onsen, though also in Gunma like Manza, it doesn't get as much snow since it's not as high up, and despite its many attractions (the onsen was confirmed to be one of the locations that inspired the Studio Ghibli movie "Spirited Away"), Shima Onsen has managed to keep itself from being overdeveloped and has a very charming small-town feel. Shima Onsen, with its old wooden onsen hotels, is one of the most charming places to enjoy an onsen experience, especially in the autumn and winter seasons. Many people choose to stay in Sekizenkan hotel at Shima Onsen, but we also recommend Shima Tamura or Shima Grand Hotel (they are sister companies), so you can experience both facilities with various indoor and outdoor onsen for only 500 JPY extra. 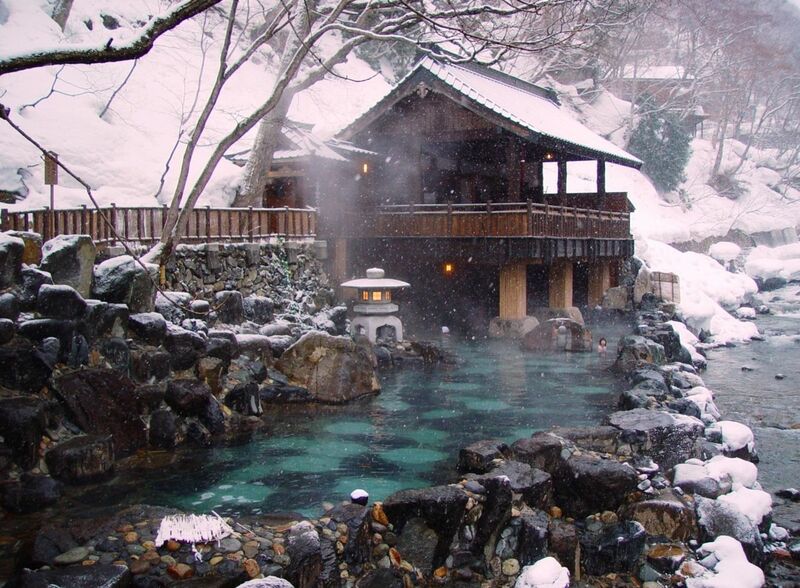 Kita Onsen is an isolated hot spring located in the Nasu-Onsekyo mountains of Tochigi Prefecture. It is also easily accessible from Tokyo and is known for being one of the oldest onsens in Japan. Staying at Kita Onsen offers visitors a unique and rare experience to be able to stay, bath and dine in an authentic Edo era atmosphere. According to local folklore, Kita Onsen was discovered by a tengu ("heavenly dog" or goblin) some 1200 years ago. There are also reconds from back in 738 of nobles traveling here for the springs' curative properties. Because of this myth, the bathing facility of "Tengu no Yu" ("The Hot Spring of the Tengu") is the most famous in all of Kita Onsen. Have you seen photos of monkeys bathing in hot springs? The famous imagery is located in Nagano, and Shibu Onsen is the town where many people stay while they are in Nagano and after watching the monkeys bathe at Jigokudani Monkey Park (no, you cannot get into the onsen with the monkeys). After peeking at monkeys bathing, you can enjoy the hot springs for yourself at one of the amazing hotels and ryokans at Shibu Onsen. 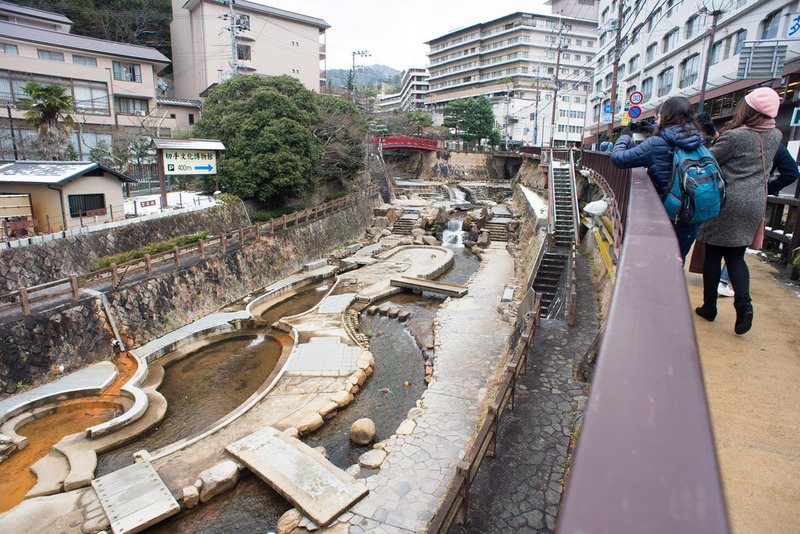 If you're staying at Shibu Onsen town, you can use 8 of the 9 open-air baths for free. For Studio Ghibli fans, stay at Kanaguya ryokan, which is said to have been inspiration for the model bathhouse in the film, "Spirited Away". 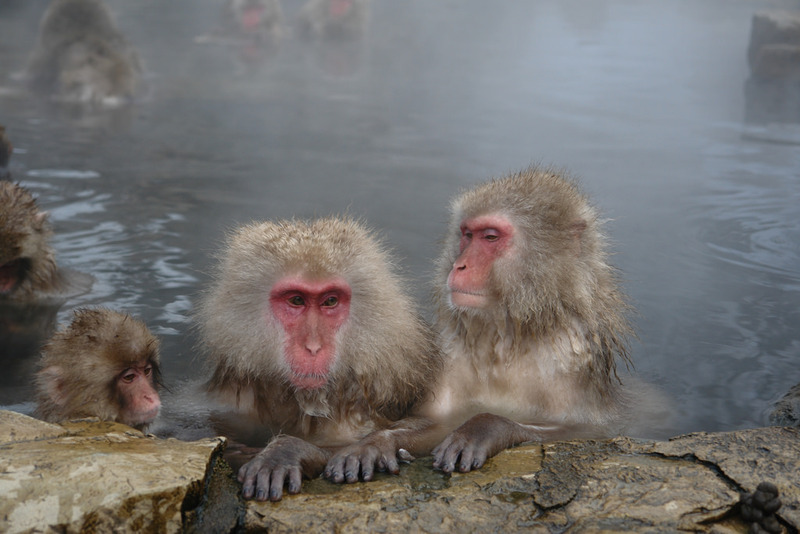 Don't miss a chance to see monkeys bathe in onsen and do it for yourself at the many public baths in Shibu Onsen! Kinosaki Onsen, located in in Hyogo Prefecture on the coast of the Sea of Japan, has a history dating back 1300 years and is one of the top onsen destinations in all of Kansai region. 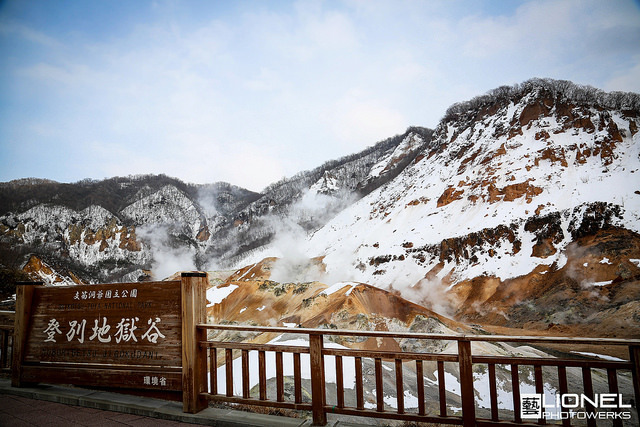 The hot springs were first discovered here in the 8th century and has since developed into a charming onsen town with seven open-air hot springs all within walking distance from each other. In the evenings, the guests can grab their "Yumepa" passes, which gives visitors unlimited all-day access to the seven hot springs, and stroll around town in their yukata and geta (wooden clogs) visiting all the different onsen. The pass costs 1200 JPY for adults and 600 JPY for children (it can be purchased at any of the participating hot springs). Kinosaki Onsen is also a great place to try onsen-related food, such as boiling eggs in the hot spring water to eat in front of the Kinosaki Gelato Cafe Chaya. The onsen tamago (literally "hot spring egg") are popular to eat among locals and is a great experience for anyone who wants to enjoy sitting in the hot spring and eating eggs at the same time! Arima Onsen is located within the city limits of Kobe in Hyogo prefecture. 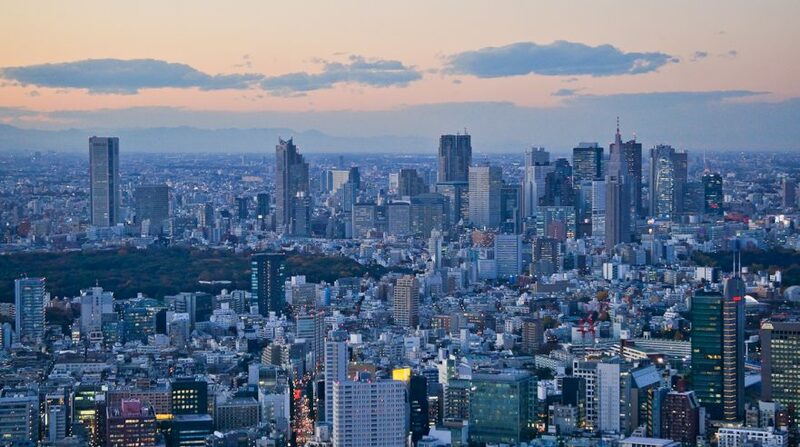 Although the town is in the mountains, it is a popular weekend location for residents living closeby in Kobe and Osaka. It is also one of Japan's oldest onsen resorts (the two other oldest onsens are Ehime’s Dogo Onsen and Wakayama’s Shirahama Onsen) with history over one thousand years. The town offers golden springs and two kinds of silver springs. The Kinsen ("gold water") is brown in color with iron deposits and is said to be good for skin ailments and muscle pain, while the Ginsen ("silver water") is clear and contains radium and carbonate. It is said to cure various muscle and joint ailments. There are two public bath houses at Arima Onsen, but visitors can also enjoy onsen in the town's many ryokan. There are some ryokan that also open their baths to non-staying visitors during the day. 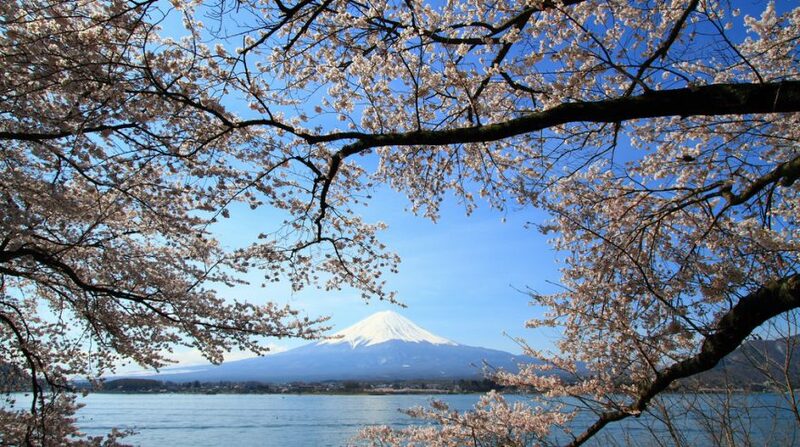 The admission fee for a bath in the daytime is usually around 500 to 2500 JPY. 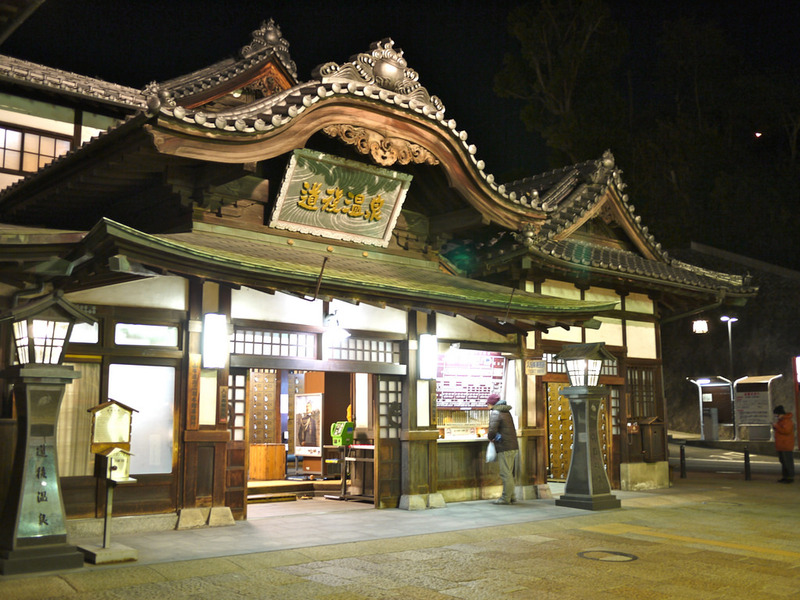 Dogo Onsen is by far one of Japan's most famous onsen. Located in central Matsuyama in Ehime Prefecture, the area is popular for its beautiful bath houses, and famous and prestigious guests such as the Imperial Family are also frequent visitors. Dogo Onsen is considered to be the oldest onsen resort in Japan (approximately from 1894), but there is no official records and it is hard to tell when exactly the first onsen was built here. It is also famous for being another main inspiration for the bathhouse in Miyazaki/ Studio Ghibli's popular animated film, "Spirited Away". The resort consists of two buildings: the original building "Honkan" and the newer and bigger "Tsubaki No Yu". The interior of the Honkan is a maze of stairways, passages and rooms, all of which bustle with bathers and staff. 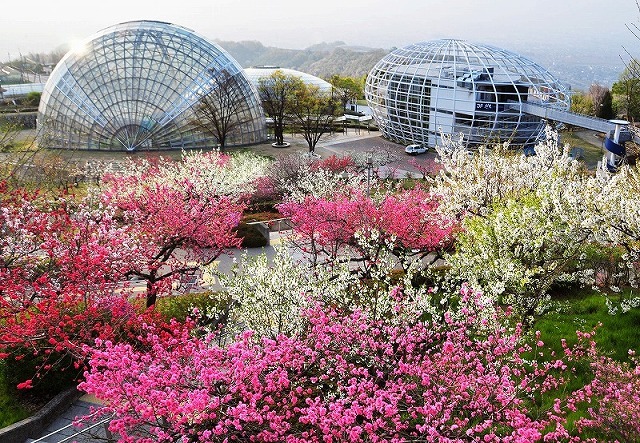 We recommend the "Tsubaki No Yu" as it is bigger and not as busy as the main building. 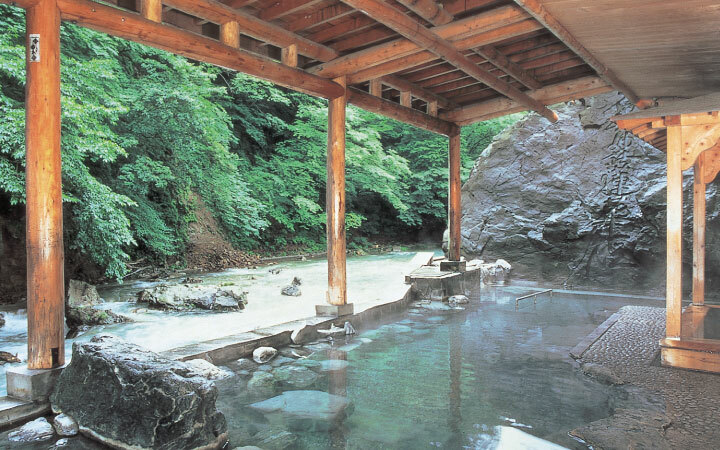 Dogo Onsen boasts Alkaline spring waters which improve skin conditions and sanitizes wounds. It is very gentle to the skin and fit for children and elderly. 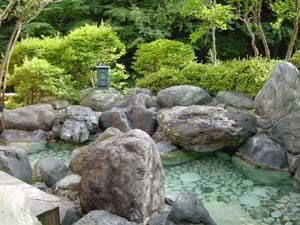 There are 29 different hot springs feeding the source of Dogo Onsen. The various spring waters are mixed and used in the bathhouses. If you have sensitive skin or want to experience old, opulent bathhouses, we highly recommend Dogo Onsen. Beppu Onsen in Oita prefecture boasts the greatest volume of hot spring water in Japan. It might look like the town is on fire but its just the steam of the hot water rising from the ground. The area is also famous for its "Hell Tour," a series of eight unusual hot spring spots that seem to be out of this world. 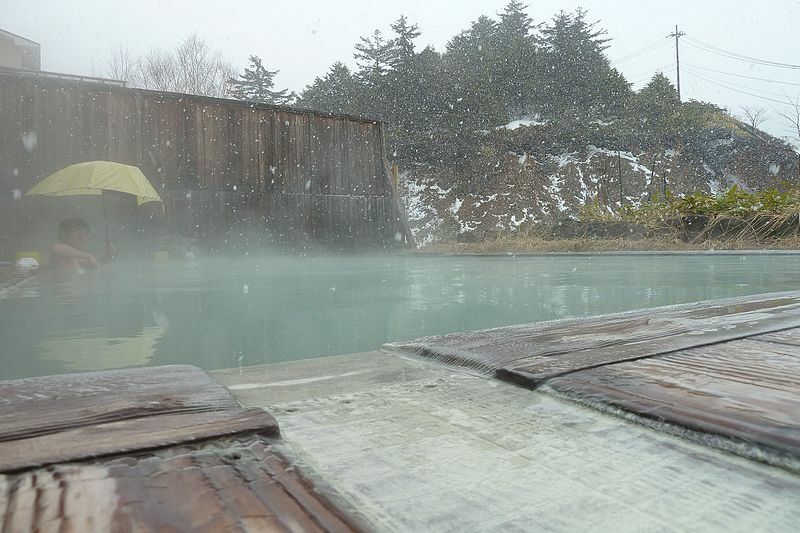 The blue-colored onsen, for example, gets its color from sulfuric acid and its temperature is 98 degrees Celsius. 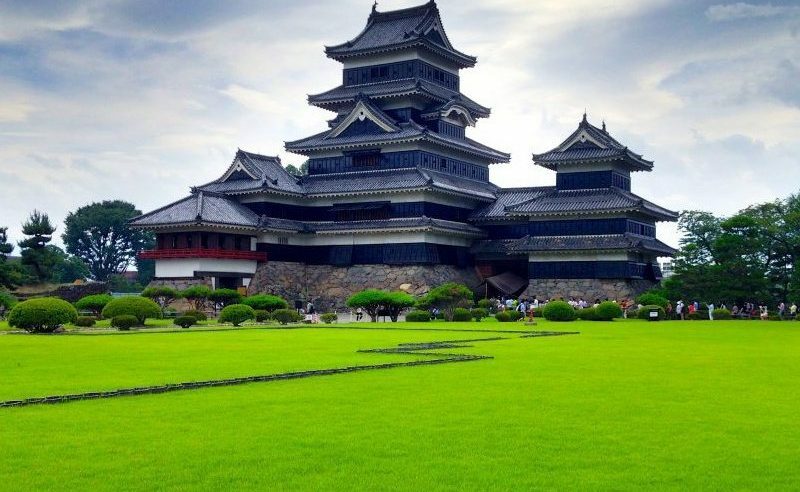 This tour is worth a visit alone, but we are here for the onsen we can bathe in, right? Beppu Onsen offers a wide variety of indoor and outdoor hot springs. In addition to normal hot baths, they also offer sand baths. You get buried in the rich soil heated up by the hot springs moving underneath the surface and relax for a few minutes. It's a great way to get rid of fatigue. In other words, with its variety of hot spring types, Beppu Onsen is truly unique and an ideal place for a relaxing holiday.